We have an updated tutorial of how to use dhtmlxGantt with ASP.NET on the server side. Unlike this guide, we use REST API so that the code appears far more simple. If you are familiar with ASP.NET MVC and dhtmlxGantt and you just want to dive into the code, download the final demo app. If you need the detailed instructions on how to use dhtmlxGantt with ASP.NET MVC, keep reading the tutorial. First of all, you need to create a new MVC project. The next things you need are dhtmlxGantt and EntityFramework libraries. You can install them using Nuget Package Manager. Once all necessary libraries are installed you can proceed to the first step. In this code we’ve specified scales configuration – two line scale that will display days and weeks. Also we defined labels text for milestones and sections of the task details form. At the end we’ve specified the format of dates for data loading (this is needed to parse the server-side data correctly) and initialized our Gantt chart. Note that classes for Tasks and Links can have any number of custom columns that can be accessed on the client-side. In this class, we link our models with database. The context class will use connection string named “GanttContext”, so you’ll need to define one in order to fetch the database. Now it came the turn of loading data. The client-side dhtmlxGantt component uses simple JSON structure as described here. Basically it is an object with two array properties, one for the links and one for the tasks. Task dates should be serialized in format specified in gantt.config.xml_date, that has been defined in the main.js. We need to create a JSON object with two arrays for Tasks and Links. that object to add new entities to the database. For each entity type, the code creates a collection of new entities, adds them to the appropriate DbSet property, and then saves the changes to the database. After all the steps described above, we’ve built a Gantt chart that loads the tasks from the database but that’s not enough. Our next goal is to save changes made on the client side to the server. For this we will use dataProcessor on the client. This library is integrated into dhtmlxGantt and automatically traces the changes made on the client side and sends updates to the server, so we need to configure the server to handle these requests. GanttRequest class has several properties to store the action info that came from the client side, and one method that creates a collection of data actions from the request values. which is common for all DHTMLX components that use dhtmlxDataprocessor. By default, requests for insert/update contains only one id, while requests for deleting may have multiple items specified. Although, in general case, the request may contain any number of operations of different kind. First, we change the current culture to InvariantCulture. This is needed for more predictable parsing of request parameters – the format of dates and numbers that comes from a client-side component does not depends on the server-side culture settings. Then we parse request values into collection of individual data actions and store it in request variable (GanttRequest class has been defined in Models/GanttRequest.cs). Depending on action and mode, we populate UpdatedTask or UpdatedLink objects from the request values. Now, depending on the action, we need to save the changes. For this, we will create in HomeController.cs Save action, two private methods: UpdateTasks and UpdateLinks. We also create GanttRespose method for XML response. In the Save action we parse the request values into collection of individual data actions. Then for each data action, depending on it’s mode, we perform update on links or tasks table. After updates are done, we need to return the response for the client side. Method GanttRespose renders the XML response that will notify the client-side about the result of operation (success or error). UpdateGanttTaks and UpdateLinks methods are fairly simple. They call Entity Framework function to update/insert/delete new tasks or links. Now, if you run the application after these updates, you can create/update/delete tasks and links on your Gantt chart. If you followed this tutorial, you now have built an interactive Gantt chart with ASP.NET MVC backend. 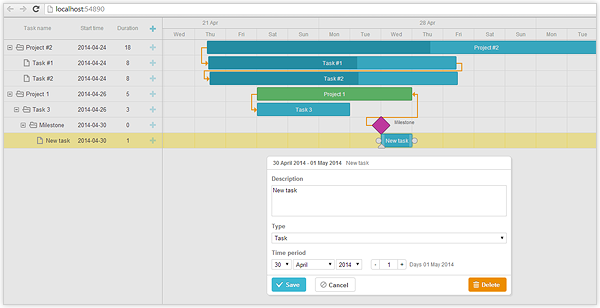 The end users can create and manage tasks using an intuitive drag-and-drop interface. All the changes are saved to the server and updated in the database. Using dhtmlxGantt API, you can extend the functionality of your app and customize it further to your needs. Hope, this basic example will be a good help for you. 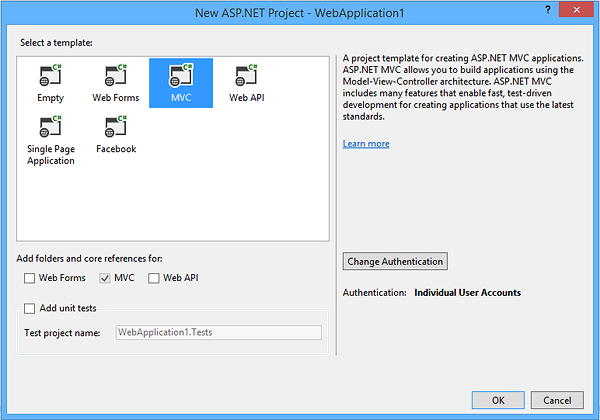 Download the final demo app to better understand this integration of dhtmlxGantt with ASP.NET MVC. Hello all, i just downloaded the standard version of DhtmlxGantt, I am trying to incorporate it in my ASP.Net MVC application and it is not working. I followed the tutorial with every step and it doesn’t seem to work. It is a MVC5 application using the Razor view engine. I do have some other stuff on the same page as the Gantt, but even when trying to put it on its seperate page, it does not show up. when I tried the sample file provided for download, it did work. Yes – I have just tried the same thing with MVC 5 application and it does not seem to compile the GanntRequest. I need to add some editable custom columns. Do you have any step-by-step instructions for the same. Hi Jose, seems like element with id ‘ganttContainer’ does not exist when gantt is initialized. Make sure you’ve added div with such id and that gantt.init is called after it’s loaded to the page – either put main.js below this div, or call it’s code from window.onload. Hi, Ivan. Thanks for the reply. I have the div id ganttContainer and now i put the main.js below it, the gantt.init is calling the id “ganttContainer” but the error persists. I figured out this error only appears when i’m not in my gantt view, but in any other view. Is it any mistake of mine? Ivan, thanks once again. I’ve just asked you, but I solved this question. The Problem is: i put the “main.js” below my @renderBody. It made each “view” using this js file and the error ocurred. I’m gonna try the Gantt, and I hope we do business together. How do i get reordering to work on MVC, gives me a “Requested value ‘order’ was not found.” error. Hi Matthew, any luck sorting this out? I’ve been working on this problem today. I got as far as determining that the GanttAction being returned by the DataProcessor is ‘order’, which is not one of the enum values listed in the TERRIBLY CONFUSING blog post on MVC integration. If you add a fifth value of ‘order’ to the GanttAction enum (along with adding a “case GanttAction.order:” clause to the switch in the UpdateTasks action) then you will at least be able to avoid the “Requested value…” error, but this doesn’t really get you any closer to a solution. With the changes listed above I’m now able to manually edit the SortOrder values directly in the database (i.e. 1, 2, 3 , 4…), and I’ve confirmed that the values are maintained throughout a round trip to the client and back, but these values don’t seem to influence the task order in the rendered chart . The other problem I’m having is that re-ordering the tasks doesn’t actually influence the ‘order’ values that get sent back to the server by the DataProcessor; whatever values were retrieved from the database are returned to the server unchanged. How can I assign resources to the tasks? #4 Gantt chart was updated correctly with my new task, great! #5 When I click refresh on IE, the new task didn’t show up. I checked local SQL server db, my new task was inserted successfully. I have a problem with Step 3. I’ve done everything you said, but in result i’ve got no Tasks in my view. I’ve the newest version of dhtmlxGantt, downloaded from Nuget and there is no dhtmlxgantt.css file. I add my context to section. Should i worry? What am i doing wrong? I can`t seem to get the tasks into the diagram. hi, how is the progress field in the database calculated? no calculation is performed by default. When you specify the progress value on the client side it is saved to the db as is. is Hours Scale view possible on standard edition? Hi Wally, yes, Hours Scale is included in the Standard functionality of Gantt. Check the output of GetGanttData() action in “Step 3 – Loading Data”. The error says it returns an invalid JSON, probably there is some kind of a runtime error. Steve, could you please describe your problem and post it to the forum http://forum.dhtmlx.com/? You’ll get help faster in this way. Are all charts from this list supported? 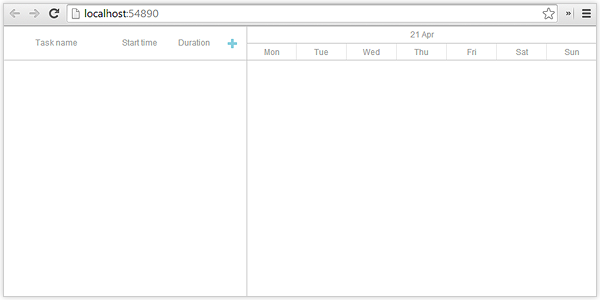 Not sure if I fully understand the question, but the Gantt chart is a bit different thing from charts at Shield UI (i.e. different component with a different purpose). Please check if there any console errors and check the page with the DOM Inspector in browser dev tools. This sample loads data as json. Have you tried to download final demo? Does it work for you? If it doesn’t work for you, could you create topic in forum ( http://forum.dhtmlx.com/viewforum.php?f=6 ) and attach your demo or data sample. GanttData shows as error, can u please help me. You should probably use GanttRequest instead of GanttData. Because it is an issue in article. Showing Error Value Cannot be null. While Adding Task from Gantt Chart for ASP.NET MVC with dhtmlxGantt. An exception of type ‘System.ArgumentNullException’ occurred in mscorlib.dll but was not handled in user code. Any additional information about the issue or a demo would be very helpful. Hi, thanks for the tool.I successfully implemented the Gant chart.I have one issue.While loading Gant line is showing but when i change the window size or minimize or maximize the window then gant line is appering otherwise it will not..Please to do needful. Any demo or screenshot of the issue would be very helpful.